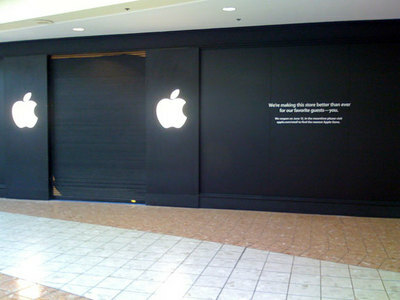 A couple of weeks ago I walked by the Kenwood Apple Store and it was closed for remodeling, reopening on June 12. Yesterday, I went to the Apple Store with my Mac Pro that needed some repairs. Lucky for me there was still two months left on my 3 year Applecare warranty plan. The Apple Store is still recognizably Apple, but the look is very different. The whole center part of the store used to be shelves of software which have now been replaced by large tables and stools where laptops were being demonstrated. Most of the non-computer product has been pushed into the corners in the back with only a small wall of software being displayed. It was 3:00 Wednesday afternoon and the place was packed. 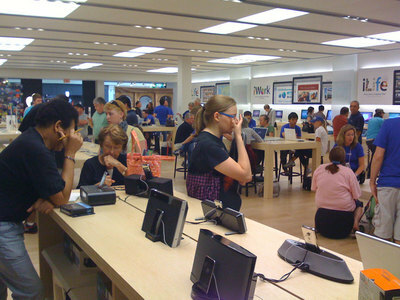 Lots of people waiting at the Genius Bar and people in every stool trying out the Macbooks. In contrast, I walked by the Sony Style store and there were probably a total of 7 people inside.